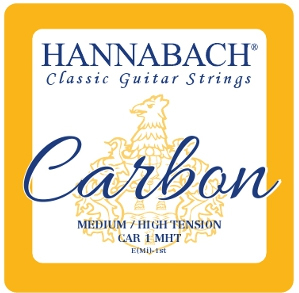 The Hannabach carbon G string is a definite improvement over conventional strings. It reduces the "tubbiness" that is usual on G strings. Intonation is satisfactory. The Hannabach carbon top E string sounds great but seems to have a problem with intonation. The 12th fret is slightly flat, and the 14th fret is seriously flat. This seems to be because the carbon string is thinner than a regular nylon string and therefore more elastic and hence its tension does not increase as much as a regular string when it is fretted. The problem could probably be overcome with a bridge that has each string individually adjustable, but this is rare on classical guitars. On classical guitars, the G string is always problematic, with a "tubby" sound. The Hannabach carbon G string is a big improvement. These strings are a little tricky to tie on they are very slippery and you have to make sure they have a good bite before cranking the tension. once they are on they are very responsive and quickly go in tune. They are a little smaller in diameter than what I have been using but that doesn't stop them from having a overall loud tone. The best carbon I've ever used. They have all the benefits of carbon...projection, fast attack, and subtle tonal variants...but none of the bright harshness common to many carbons. Much warmer tone than most. Long lasting and great intonation too.